The first to catch our eye and one of the most important components is the bridal necklace – brides all over the world will agree! It adds that extra appeal to the bridal ensemble, bringing with it a distinct touch enhancing the bride’s look – whether with bold polkis, or delicate gold necklaces, this is one piece of bridal jewellery that shouts out bride like no other. We’ve put together ten of our most unmistakably gorgeous bridal necklace designs handpicked from our Real Weddings and we’re sure you will love them just as much as we do! Ekta opted to go for a stunning gold necklace embedded with pink gemstones to match her vibrant lehenga. More from this Real Wedding here. 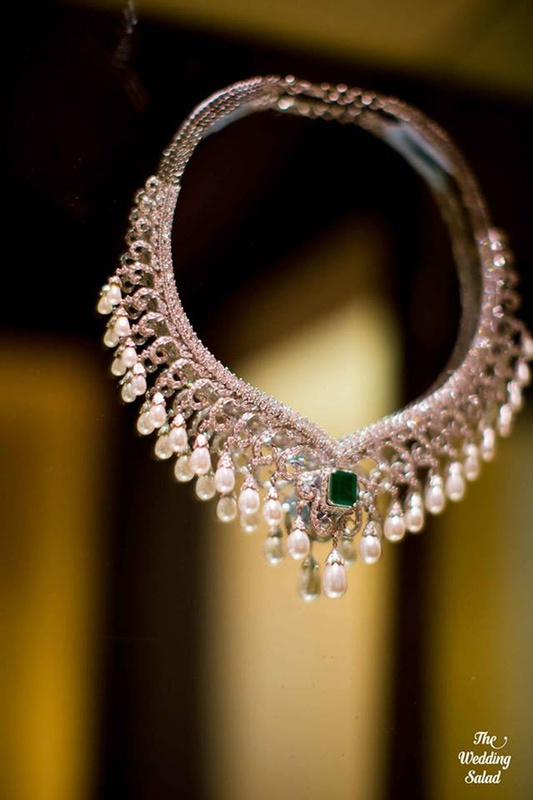 Harneet made a bold statement with these royal-looking asymmetrical uncut diamond choker. The off-white dangling pearls only increased the beauty of this necklace. More from this Real Wedding here. This stunning necklace with all polki and a dangling maroon beaded border was a perfect pick for our regal bride, Natasha. More from this Real Wedding here. Rajshri wore an intricately designed antique gold necklace embellished with cut rubies, diamonds and large pearl drops. More from this Real Wedding here. Gorgeous polkis embedded on to a gold necklace with emerald green drop beads – Miloni did it so right! More photos from this Real Wedding here. Sasha Bajaj continues to take our breath away everytime we see her wedding album. Very rarely do we see brides donning a combination of sapphires with gold and polki – and absolutely striking combination! One of our most stunning brides Ekta, went all classic with a Temple and Coin Necklace and it looked absolutely ravishing! More from this Real Wedding here. A regal fort palace wedding like this only deserves ethnic, understated jewellery, like Priyanka wore. More from this Real Wedding here. Our all-gold shimmery bride, Karishma was all kinds of pretty in her layered gold necklace with drop patterned beads and purple flower enameling. More photos from this Real Wedding here.